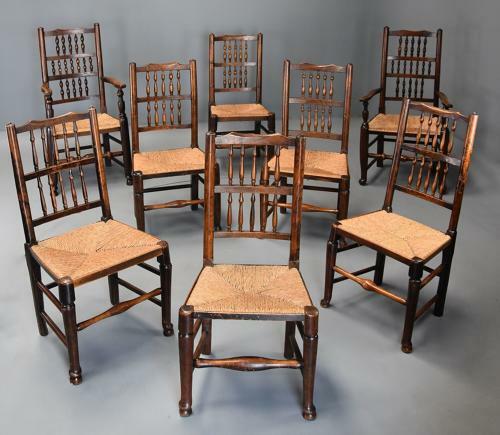 This set of chairs consist of two armchairs and six single chairs, the armchairs each with a shaped top rail with upper and lower galleries of five turned spindles and a row of seven smaller turned spindles to the middle with uprights to either side. The shaped arms supported by turned underarm supports leading down to a rush seat with wooden protective strip to the front, sides and back. The chairs are supported on turned legs to the front with pad feet with square legs to the back, the legs joined with stretchers with turned stretcher to the front. The single chairs consist of a shaped top rail with two rows of five turned spindles with uprights to either side leading down to a rush seat with wooden protective strip on all four sides, supported on turned legs to the front with a pad foot and square legs to the back, the legs joined with stretchers with turned stretcher to the front. This set of chairs are a matched set, you will see from the images they have some slight differences but are all very similar, the rush seats have been replaced at some time so are all in very good condition, the seats also having swabs. This set of chairs are in very good condition for age, they are all of stable construction and can go straight into a home.